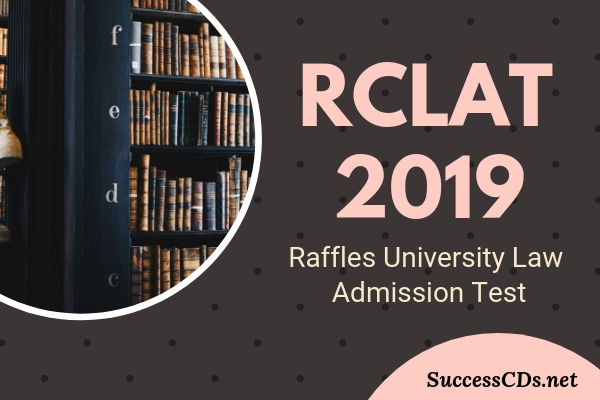 RCLAT 2019 Raffles University Law Admission Test - Raffles University Neemrana invites applications for Common Law Admission Test RCLAT 2019 for admission to 5-years Law Courses BA LLB (H) and BBA LLB (H) for the academic year 2019-20. Candidates can fill their application form from the official website as per schedule date. Candidates can check the complete information of Raffles University Neemrana Law 2019 like application process, eligibility criteria, reservation etc through this page given. Senior Secondary School Examination (10+2 system) or equivalent Examination with minimum 50% marks. The candidates appearing in the 12th standard examination in March/ April 2019 can also apply. Seat intake for RULAT 2019 is not yet released, candidates can use the given information as reference only. As this date is based on last year. The students are requested to visit www.rafflesuniversity.edu.in for R CLAT 2019 application form and follow the instructions.